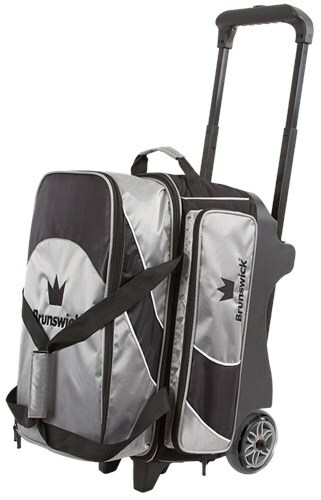 Get your bowling gear into the Brunswick Edge Double Roller bowling bag! This bag is a level up from a basic double roller due to more durable materials, larger pockets, and more advanced features. This bowling bag can carry 2 bowling balls, shoes up to a men's size 17, and accessories plus it includes a 5-year limited manufacturer's warranty. What are you waiting for? What are the dimensions of the bag, H, W & D? Does the handle lock in the extended position? Hi Dennis! The dimensions for this bag are H:37"x W:11.5" x D: 10". The handle will extend to 37"
DOES THE SHOE BAG HOLD 2 PAIR SHOES? Hello Susie. This bag holds up to size 17 men's shoe. Due to the time it takes to produce the Brunswick Edge Double Roller Silver ball it will ship in immediately. We cannot ship this ball outside the United States.